09/04/2019 - Awards Success for Taylor Woodrow! Our M20 Junction 10A team recently installed two new interchange bridges to form the new junction's gyratory. VINCI PLC have achieved the BSI Kitemark Accreditation for BIM Level 2 PAS 1192 PART 2. Taylor Woodrow has secured a place on Highways England’s Regional Delivery Partnership (RDP) to design and build major highways schemes in the South West over the next six years. Taylor Woodrow held the inaugural Supply Chain Awards on Thursday 18th October at the ICE in London. On Wednesday 10th of October, Taylor Woodrow were awarded with the ‘Best Main Contractor to Work For £50m-£250m’ at the Construction Enquirer Awards. Our Victoria Station Upgrade (VSU) team has received a prestigious RoSPA Gold Medal Award for health and safety. The M6 Junction 2-4 Smart Motorways Project (SMP) has, in its first four months on site, been awarded four Highways England Blue Star Awards. In April, the Victoria Station Upgrade team were awarded with their fifth consecutive Gold Considerate Constructors Scheme (CCS) National Site Award. On Wednesday 28th March, Taylor Woodrow held its 'Delivering Our Future' forum attended by strategic supply chain partners. Congratulations to our Allerton Waste Recovery Park team for being shortlisted for the ICE Yorkshire and Humber Annual Awards 2018. Three members of the VINCI Construction UK team attended the Brighton, Hove & Sussex Sixth Form College (BHASVIC) Futures Fair in Brighton. Bernie Graham, Director of Mental Health Support Training and Consultancy Ltd, recently achieved his 150th delivery of the 2-day course with the Filton Bank team. The new Wilton road entrance and South Ticket Hall has opened at Victoria station. At Filton Bank, Site Engineer Muna Alkaabi has assembled a group of volunteers and started on a programme of school visits to inspire the next generation. 14/01/2018 - The year of engineering is here! We’re proud to confirm that Taylor Woodrow are a Top 10 winner in the 2017 Construction Enquirer Awards. The Filton Bank Four Track team worked around the clock at the weekend to complete crucial demolition works. Transport for London (TfL) has announced Taylor Woodrow as the successful bidder to design and rebuild the station by spring 2019. 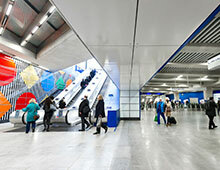 On Friday 30th June, Daniel Buren visited Tottenham Court Road Station to officially unveil a new piece of artwork. The theme for World Environment Day (WED) 2017 was ‘Connecting People to Nature’. We have been working with a number of companies to research the cost of avoidable error in the construction industry. March saw the Taylor Woodrow team welcome the class of 2016 in our first celebration dinner for new starters. After two years of planning, the remaining spans of Southall’s iconic Merrick Road footbridge have been dismantled, preparing it for its new life at Didcot Railway Centre. 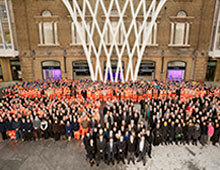 The Old Oak Common team recently took a rare opportunity to invite friends and family to the site to see the project. The team were amongst 85 advisors from over 46 different professions acting as advisors for the students. 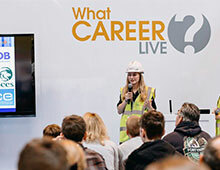 The Crossrail West Stations (CWS) team has partnered with a local all-girls school to support students through the Engineering Education Scheme. A new climbing frame for St Elizabeth Catholic Primary School in Bethnal Green has been jointly funded by teams from Crossrail’s C510 (Whitechapel and Liverpool Street Tunnels) and C512 (Whitechapel Main Station) projects. The Women in Taylor Woodrow Steering Group have started planning for 2017. 24/11/2016 - Whitechapel - One in a Million! Alicia Grayeb, Environmental Assistant at Taylor Woodrow’s Filton Bank project, was recently a finalist in the Women’s Federation for World Peace Speech Contest for young women in the UK. 14/10/2016 - VSU host Honor Goodsite's first site visit! The Victoria Station Upgrade team recently hosted the launch of Honor Goodsite, the UK construction industry’s female mascot created by the Considerate Constructors Scheme. Last week saw Taylor Woodrow’s Old Oak Common team scoop the Sustainability Award at the National Rail Awards. Members of our Bexhill to Hastings Link Road team recently attended the Institution of Civil Engineers (ICE) South East England Engineering Excellence Awards. Louise Lawson is one of Taylor Woodrow’s sponsored students, studying at Reading University. Our Allerton team recently celebrated a major milestone when a 170T section of the park’s second boiler was installed. Three of our project teams recently recognised at industry awards. The Victoria Station Upgrade team has recently been announced as the winner of the Complex Infrastructure Award at the 2016 ICE London Civil Engineering Awards. The Ealing Broadway team has successfully installed Crossrail West’s first complete bridge. Congratulations to Howard Sayers, Sub Agent at the Victoria Station Upgrade, for winning the British Tunnelling Society’s 2016 Harding Prize. Members of the Victoria Dock Portal team recently came together to complete a project to help a local library. The Bexhill to Hastings Link Road opened today and will bring an estimated £1 billion of economic benefits to the local area. 08/12/2015 - Two major milestones for the TCR team! 17/11/2015 - Old Oak Common team shortlisted in UK Rail Industry Awards! The design-build contract covers the energy from waste unit and related buildings. 09/12/2014 - Victoria Station Upgrade Scoops International Tunnelling Award! The project team at the Victoria Station Upgrade scooped a prize in two categories at the Green Apple Environmental Awards which took place at The Houses of Parliament recently. 30/10/2014 - Ivan Warnes appointed President’s Chief Representative in the Middle East. Taylor Woodrow International’s commercial director is set to assume a major role on behalf of the Chartered Institution of Civil Engineering Surveyors (ICES). A group of almost thirty employees have launched an initiative designed to support women in the workplace. A quantity surveyor based in Essex has completed the Royal Parks Half Marathon, raising over £600 for charity in the process. Members of the Victoria Station Upgrade (VSU) team have climbed Heron Tower, one of London's most iconic buildings, to raise money for the Construction Youth Trust. Civil Engineers from Taylor Woodrow working on the Old Oak Common Depot project have laid the final touches to an eco-house at Phoenix School Farm in Hammersmith. The project team at Connaught Tunnel have welcomed members of the public as part of the Open House initiative. A large number of Taylor Woodrow site and office teams participated in activities that supported World Environment Day. The Victoria Station Upgrade team have won Taylor Woodrow’s Defect Free prize. The Tottenham Court Road team have been given a RoSPA Gold Award for health and safety. Taylor Woodrow, a division of VINCI Construction UK from Watford has been awarded the new ‘Be Fair’ Accreditation by the Construction Industry Training Board following a pilot scheme. Five Taylor Woodrow projects won top accolades at this year’s Considerate Constructors Scheme National Site Awards. 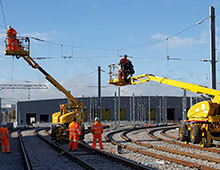 Bombardier Transport UK Ltd has awarded Taylor Woodrow a £142m contract to design and construct an 8-rail track depot for the Crossrail train fleet at Old Oak Common, West London. VINCI Construction UK’s Managing Director, Andrew Ridley-Barker, is among a line-up of influential speakers scheduled to address an audience of experts at the 2014 London Infrastructure Summit. Twelve VINCI Construction UK projects have claimed top industry prizes at the Considerate Constructors Scheme’s (CCS) National Site Awards. First broadcast at the 2013 company road shows, they feature the people and projects that embody the vision and values of VINCI Construction UK. Taylor Woodrow has been appointed for the design and planning stage of the Croxley Rail Link, a £118m scheme which will bring the London Underground to the centre of Watford. The following articles appeared in Rail Magazine. Click to view each in full.